First up we have a great choice of prizes from Motel, which include the Marsha dress, Angelica dress and Grace playsuit. Motel's online store offers a huge range from the latest Motel collections, a vintage section, plus a selection of amazing Jeffry Campbell shoes. Motel has free delivery on all US and UK orders and very decent shipping rates for the rest of the world. Next up we have another choice prize from the French jewellery label Les Jumelles. The lucky winner of this prize will be able to choose either the Lion cuff or Coup de Coeur bow cuff. Les Jumelles sells beautiful and whimsical pieces which have been in featured in countless magazines and on my favourite blogger, the Cherry Blossom Girl. The lovely Sorcha of Dandelion Daydreamer is offering one lucky reader a $75 gift voucher to spend on anything they desire from their Etsy store. Sorcha is an Irish girl living by the beach in the sunny South of France and she hand-picks all the vintage treasures in her shop. The gorgeous range of vintage dresses and bags will make it very hard for the winner to choose what to spend their voucher on! The generous people behind Style 13 are offering this intricate, hand-crafted ring by British label Kat & Bee to one lucky person. Style 13 offers branding, marketing and distribution services to international designers who want to break into the US market. Their curated e-store gives consumers access to unique design collections not found anywhere elsewhere in the US, such as Renvi, Caldwell and Kat & Bee. The team at Oh My Frock are offering one reader their choice of the studded wool mix jumper, oversized cream snood or leather & lace dress. Oh My Frock aim to provide stylish and affordable pieces while ensuring each customer has an easy and fun online shopping experience. To qualify for the Oh My Frock bonus prize be sure to like their facebook page. To enter the giveaway, simply leave a comment with your email address on this post! Remember to like the Oh My Frock facebook page to qualify for the bonus prize. ♥ The giveaway is open to WORLDWIDE readers. ♥ Entrants must 'like' the Oh My Frock facebook page to qualify for the bonus prize. ♥ Giveaway closes Sunday 20th February and the five winners will be picked randomly. Good luck to everyone and I hope you have a lovely Valentines day! I liked "oh my frock" on FB - Eva M.
That's an amazing give away..each company has beautiful items..they were very generous & I am sure whoever wins will be thrilled!! I´m in love with the Grace playsuit! Yeah for Valentines! Such cute giveaways - I'm crossing my fingers and toes! minteva at gmail dot com :) such a great giveaway, i love the leather & lace dress! oh ah what a fabulous way for the singles to celebrate valentines - with a gorgeous prize! Oh wow, I'm totally in this one! I'm not on Facebook, though, so the bonus prize is going to be out of my reach. Hopefully i can win it. Please enter me!!! Fantastic giveaway!!! Such wonderful prizes! Happy Valentine's Day! oh wow! i already loved MOTEL and now here are a bunch of lovely new lines to shop! so fun!!! love it! but I've no facebook account so I think I'm not in the Oh my fock giveaway! :( Anyway, wish me luck with the others yay! Oh my gosh, that Marsha heart dress is gorgeous. And I liked Oh my frock! 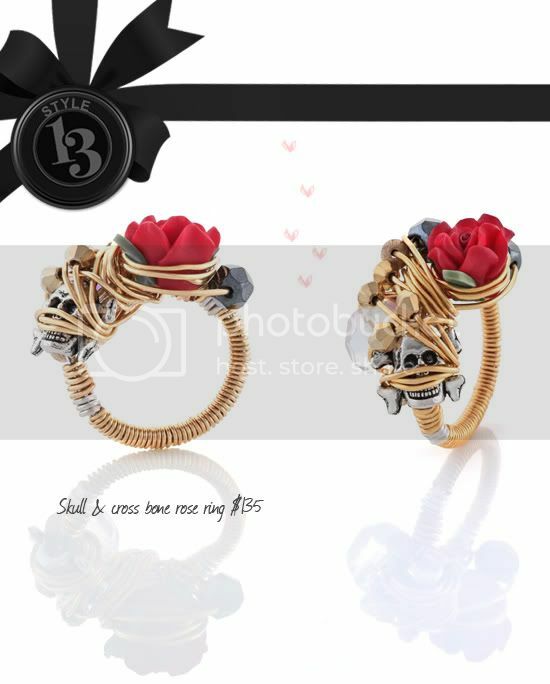 That Style 13 'skull & crossbone' ring is so amazingly pretty! 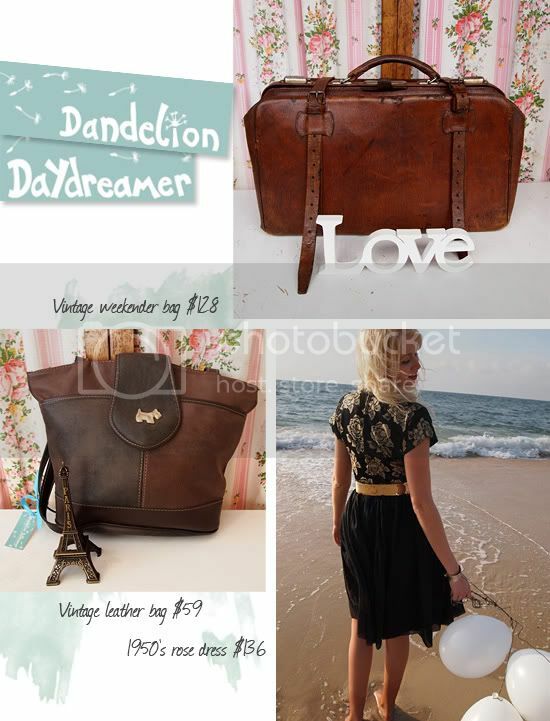 And the dandelion daydreamer Etsy-store is simply perfect. Really would like to own anything from it^^ My email is: lil_punkfish@msn.com (it's the mail I use the most). What an amazing giveaway! Count me in! wowwwwwwwww these prizes are AMAZING!! Oh my, what a cornucopia of prizes! I especially love the Grace playsuit. So many lovely items!!! This is an amazing giveaway! I would love to have any of these prizes! In love with all of these pieces! All of those items are absolutely fabulous! I would feel like a fierce runway model. Wearing any of them would be amazing! this is a great giveaway! i'm loving all the pieces motel has to offer. Hi!! This giveaway is just perfect! I'm in! AMAZINGG!! all of the prizes!! how could i not enter! count me in! and yes, liked Oh My Frock on fb. Wow ! 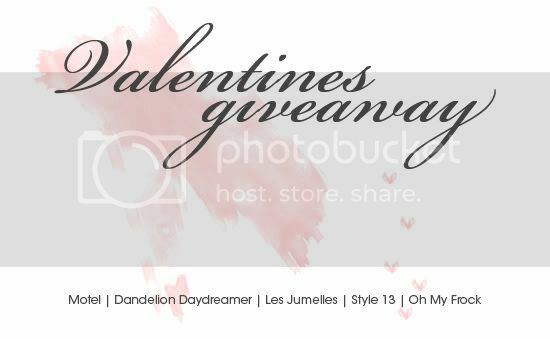 This Valentines giveaway is amazing ! I definitely am participating ! oh, this giveaway is absolutely amazing! I love everything, especially the ring from Style 13! Awesome! I'm a sucker for different and interesting pieces and the things offered here are really cool. Oh and I liked the Oh my Frock facebook page, I really love that pullover! dang, this is the giveaway of giveaways!!!! fantastic!!! This giveaway is fantastic. I especially love the Marsha heart dress. I especially like the Marsha dress and the coup de coeur cuff. Ooh how exciting is this? Thank you so much! I also liked on Facebook! I'll take any one of those prizes and just before my birthday (on the 17th) too! You always have the nicest giveaways and this one's awesome! Just discovered your blog a couple of days ago..love it! Oh My Frock "n" love this giveaway. Wonderful giveaways!!!! I would be so excited to win anything!!! And I liked them on FB! I've been reading your blog for ages but never commented before. This giveaway is amazing thank you :). Breathless-ly amazing!! Such a romantic collection of gifts, so perfect for V Day. I've liked the FB page as Michelle H.
Wow, what an awesome giveaway - thanks! so pretty! those cuffs are especially gorge. i never do these but i love all of the prizes too much to pass this up! Done!! All the things are amazing! Thank you and saludos desde Mexico! Wow, this is an awesome giveaway! Everything looks amazing, especially the MOTEL giveaways! Hopefully I'll be lucky because my birthday's on the 13th? : ) thanks for the awesome giveaway! Hey would love to submit for the drawing!! I love your style, by the way. Absolutely beautiful. Oh this is one of the best giveaways I have seen in a long time. I would absolutely love to win. Thanks for the opportunity Sushi! this is a great giveaway!! thanks! Omg, how generous and such a cool giveaway! I 'liked' Oh My Frock. Um.....WOW! Even if i don't win, great inspiring prizes! Incredible!! Love that ring and definitely buying the playsuit for a friend regardless of winning! what a huge giveaway! i would love to win and also liked Oh My Frock on Facebook. oh wow such a great range of prizes to be won! All the giveaways are so so pretty! this is soo generous!! 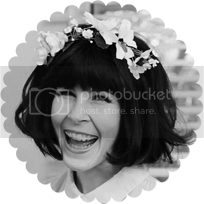 !hoping to get the vintage leather bags they're gorgeous!thank you sushi!=D=D=D love your blog! Such a lovely, lovely giveaway! Ooh! I love all the prizes and I especially love that it's all from your blog! I'm crossing my fingers! I love the lion cuff and the hand crafted ring and the Motel dress! I was on the Motel site earlier this week and that was (the heart one) the exact dress I wanted! I'm going to a fashion show for a Chicago boutique tomorrow where they sell Motel, and I'm wearing a red Gina dress :) I just love Motel! What a fabulous giveaway..thank you! I'd like to award you a stylish blogger award, because I love your posts! Wonderful giveaways! Thanks for the opportunity! Amazing giveaways! Thanks! Good luck to everyone! As unlikely as I am to win I'd love to! Such wonderful goodies~ I'd love to win! okay - these things are amazing! good things, please come my way! Omgosh!, im soooo dying for all that awesome stuff!! This giveaway is too good to be true! Almost to good to be true...! this is the most amazing giveaway ever. i think i love you. anyways, i liked oh my frock on fb! I want the Skull and cross bone rose ring and rose dress so badly! Amazing support from your sponsors!! um pretty much I have to have that bowtie dress or I'm going to die a terrible death. The weekender bag! The black motel dresses! Oh if only I could afford these. what a grand day it would be to have this perfect giveaway! Everything here is gorgeous! A dream in fact! ..and I already "like" Oh My Frock on facebook!